What? Book group night again already! Time does not seem to have flowed with a rhythmic ripple through the intervening hours and minutes, but has hurtled through this short epoch of space. Little pieces of ‘self’ seem to have come adrift as this trajectory created bumps and collisions with objects and forces along the path of this journey. But fortunately, it IS time to gather around words that share the capricious workings of fate of another’s journey. This never seems to fail to bring me back to a truer sense of perspective. 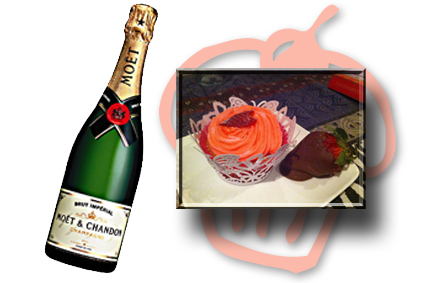 Moet. Strawberry Cupcakes. Chocolate Coated Strawberries.T’was all good. I have wondered how the ‘universe’, or however you would like to describe the forces beyond ourselves, collates the sequences of life events. I’m not talking about the larger and meaningful events in life, but the smaller arrangements of information and experiences that we come across. Our reading list for the year is compiled by firstly book group members selecting their preferred hosting month and then the book title is added as the ‘host’ decides on her book. There are no parameters given in terms of subject matter, or even the era of the chosen book. 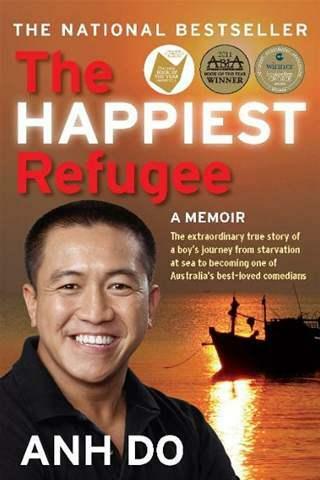 This month, it was one of Australia’s best-loved comedians, Anh Do’s memoir that we were invited to discuss. So, here we ended up with two consecutive stories of people risking all, including life, to escape their countries of birth to find a gentler, more forgiving community to play out their stories in. This literary subject matter, coupled with the too often ‘news’ stories of people perishing at sea in boats that are not worthy of carrying precious lives to new lands, are colliding. Given all the disturbing stories we hear in the press, this month’s book title, The Happiest Refugee, seems almost oxymoronic. 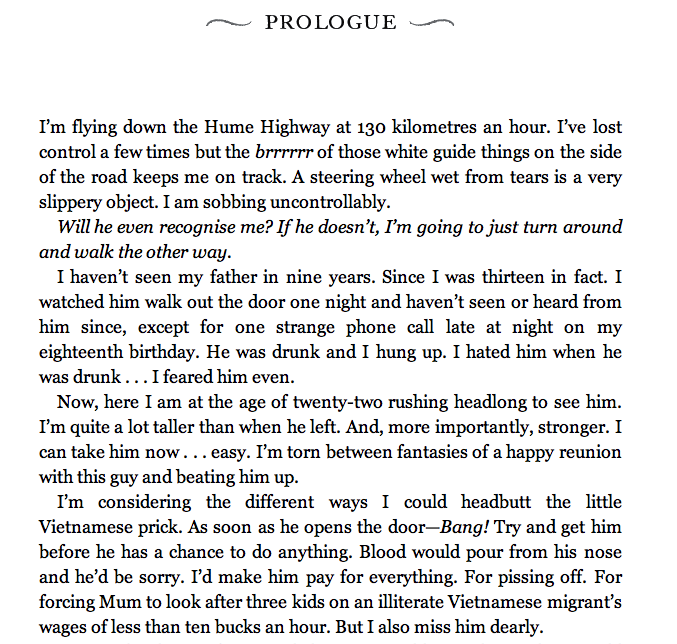 I am providing you with the first section of the Prologue, as it captures an essential sentiment of the book. This sentiment becomes particularly profound after finishing the book: how does a family who have shared the experience and trauma of escaping their country of birth, risking all, get to this point of dysfunction. Anh Do, who most would know as a comedian here in Australia, tells the story of his family’s flight from Vietnam in a comedic yet poignant way as he reveals how they nearly didn’t make it to anywhere. Their subsequent arrival and descriptions of resettling as refugees is heartwarming. Instances such as clothing allocation where Khoa (Anh’s younger brother) is dressed in girls clothes when they first arrive due to some initial confusion about gender, is told with warmth and love of this country. The description of the family’s first visit to a St Vincent dePaul store makes you laugh through your tears as 50 cent fur coats are cherished. There are countless episodes through the book of efforts the family undertake to create a life they wanted. Talk about enterprising: there’s the duck farm, the sewing industry, the fighting fish business just to name a few. When one enterprise failed to deliver all they were hoping, a new one was created. Anh’s Mum, is totally inspiring with her efforts to make the best opportunities for her children. You will chuckle about the gold necklace story that when sold to raise money for the family, Mrs Do told the buyer that it had ‘been through a very difficult passage’. (Think pirates, think hiding an item from ruthless people who were ready to cut off a finger to gain a gold ring). Anh’s Mum is an extremely generous woman who even when they had little for themselves, would share the limited resources with others. Despite continual setbacks, there was never a time that any of them sat back and said ‘woe, woe is me!’ They worked together with their extended family who included characters such as Uncle Six. But, even within this strong sense of familial duty and ties, cracks appear and individuals fall out of rhythm with the larger family mechanism. Relationships are tested and broken. What rules in the end? Individual guilt? There are so many inspiring and happy stories within this memoir that charts the passage of this family from Vietnam to a gentler life here in Australia. But we started with the prologue, telling of a meeting between father and son after a period of nine years. Despite experiences that you would think binds all participants together, there are individual characteristics within the band of people that make this future journey together impossible. In the end, heartbreaking for Anh. It seems he wrote this book for his Dad to remind him of what a remarkable contribution he made to his family in assuming responsibility, not as the elder, but as Number 3 son as he brought his family, at great risk, out of a country that couldn’t satisfy their wants. Despite the often difficult scenarios painted, this book seems a light, comedic read, but I challenge you to read between the lines to find the heartfelt plea from a son to his father to resolve issues and share again with the larger family. If you’ve read this book, would love to know what you think. Q. When is a science-fiction book not a science-fiction book? A. When it’s made into a hollywood love story movie. Do you know what book I’m referring to? Actually, the jury is still out on what genre this book falls into. Wiki reveals: Science fiction is a genre of fiction dealing with imaginary but more or less plausible content such as future settings, futuristic science and technology, space travel, aliens and paranormal abilities. So while the premise is unarguably attached to the science fiction notion of time travel, the themes this book explores are more attached to the ‘touchy-feely’ human experiences of relationship, family, love, trust. It is reported that the catalyst for Audrey Niffeneger to write this book was centred around failures and experiences in her own relationships. Perhaps her time travel theme came from her feeling of displacement in uncomfortable personal relationships. Let me say up-front, I am in awe of Niffenegger’s skill to create this complex time-travel tome and her ever-giving and forgiving heroine Clare (alter ego for Audrey?). Hmm, The Time Traveler’s Wife, not the Time Traveler. Clare Abshire is one determined and spirited young lady. Could you imagine how you would feel as a parent if you knew your very young daughter was meeting up with a naked man in your field? Just when did the concept of ‘stranger danger’ become the No. 1 talking point and the raison d’être of vigilance about knowing where our kids are become the prime thought of the day. Are you old enough to remember the days when you just had to be indoors by sun-down? We do live in a different world now…maybe. There is room for debate. Is the world different, or is our knowledge of the world different? A topic for discussion another day. Clare Abshire, The Time Traveler’s Wife. What is Niffeneger saying, she felt powerless in her relationships to make choices? So how does this science fiction book make it on to the BIG screen as a Hollywood love story? Henry loved to run in the book, and it isn’t a main point in the movie. Henry dates a girl named Ingrid, who ends up committing suicide. Clare’s mom is very depressed, and dies in the book. In the book, Gomez hits on Clare. Henry’s foot has to be amputated in the book and becomes the catalyst for his death. Clare decides to look for a house for herself, because she didn’t want Henry to tell her which one the house would be. In the end of the book, Clare sees Henry as an old woman, right before she passes away. Hollywood audiences demanded a soft, happy ending! If you want to bring a book to the BIG screen, tell it how it is. Don’t make up a new ‘audience friendly’ happy ending. 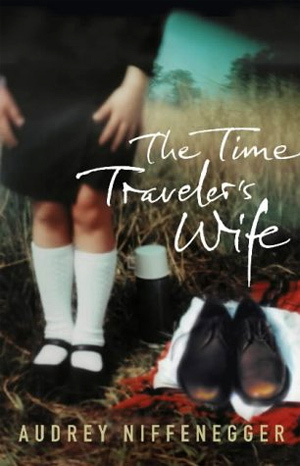 If you only saw the movie of The Time Traveller’s Wife, you have missed out on significant storyline and the characterization that richly populates the text of this book. The book, is the winner by far! I am excited by both of the next books and subsequent movies that I’d like to share with you about, but I don’t know which to start with. Hum, de, dum…okay I’ll go with Secret Life of Bees by Sue Monk Kidd. I love it when one book bridges the quite different composition of two book-groups! This wonderful book did. From two completely different spheres in my world, this book came with exciting recommendations. If you haven’t read it, race out to your favourite book shop and buy it now! It is exquisite: it brings you joy, it brings you sadness, it brings your LOL moments, it brings you hope! 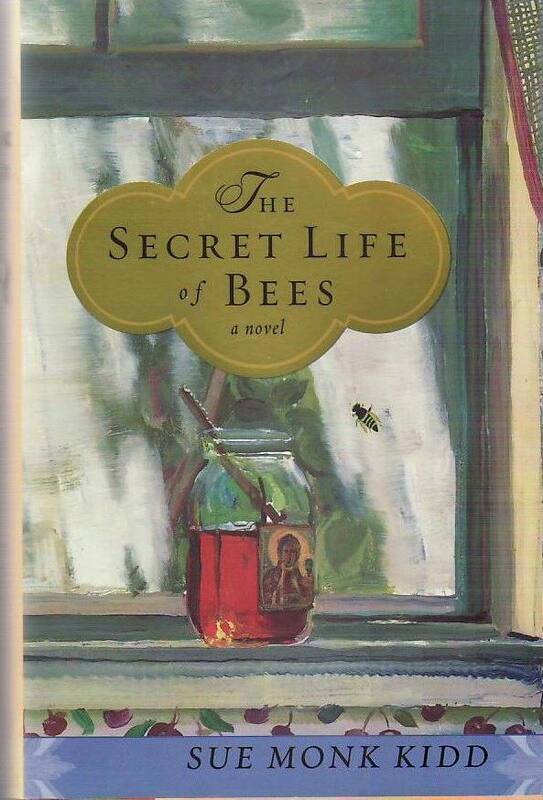 The Secret Life of Bees is a 2002 historical novel by American author Sue Monk Kidd. Set in the American South in 1964, the year of the Civil Rights Act and intensifying racial unrest, Sue Monk Kidd’s The Secret Life of Bees is a story of coming-of-age, of the ability of love to transform our lives, and the often unacknowledged longing for the universal feminine divine. Addressing the wounds of loss, betrayal, and the scarcity of love, Kidd demonstrates the power of women coming together to heal those wounds, to mother each other and themselves, and to create a sanctuary of true family and home. The book’s premise is about Lily’s search for a connection to her mother who died in a tragic accident when she was a toddler. 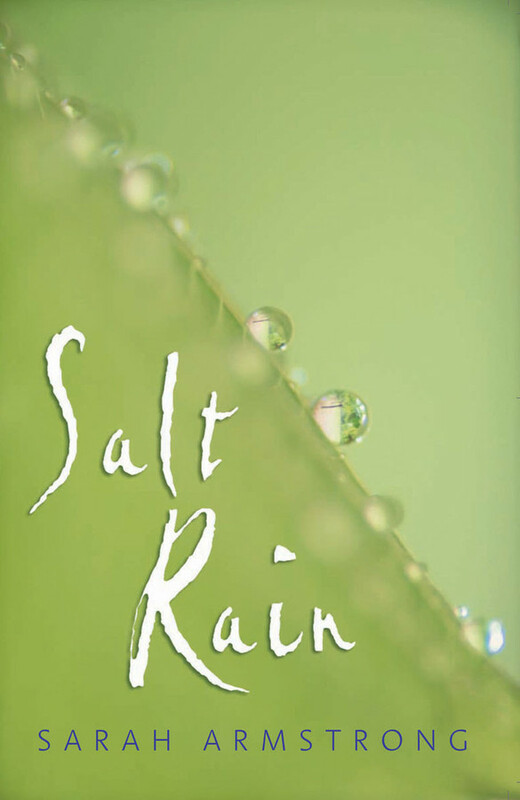 Set in South Carolina in the 1960s, this book explores race, love and the idea of home in difficult times. It is a beautifully written drama that keeps the pages turning–yes you have to work through all the trauma and disappointment, but in the end you close the cover with a satisfied sigh, ‘all is well in this world’. And the movie, it’s a little like the book reader’s request for Clark Gable to star in the movie of Gone with the Wind. The actors were almost better than a perfect match for their characters. I would say the movie was a little softer than the book, but with Queen Latifah, Alicia Keys, Jennifer Hudson (don’t you love her music! ), Sophie Okonedo (did you recognize her from The Slap) and Dakota Fanning, it was brilliant! Read the book first and then savour the movie. And my final book (maybe) in the book versus movie debate, will be tomorrow. ‘In the beginning was the word’…and the word was good. We savour it, we roll it around in our minds and often on our tongues as we seek to squeeze every trickle of literary goodness from our favorite books. When we read a book we create our own perfect ‘internal movie’ version of the characters, the scenes, the emotions. Taking a loved book to then create a movie adaptation is serious business. It’s reported that in the late 1930s thousands of readers of Margaret Mitchell’s Gone with the Wind demanded that charming southern rogue, Rhett Butler be played by yankee, Clark Gable. And they were right! The readers had gauged the flavour of this character very well indeedy! It would be near on impossible to include all text and scenes from a book and adapt them into a movie plot. Time forbids this with the approx. 90-120 minute length of a movie. A book can expand and explore multi-layers of action and dialogue both internal and external within a small patch of text. It is much more difficult to get inside the head of a character and their motivations in a movie. Here are three book versus movie experiences I’ve had. In each instance I have read the book first as part of my B.A.B.E.S. group, in fact I cannot recall an instance of seeing a movie and then deciding to read the book. 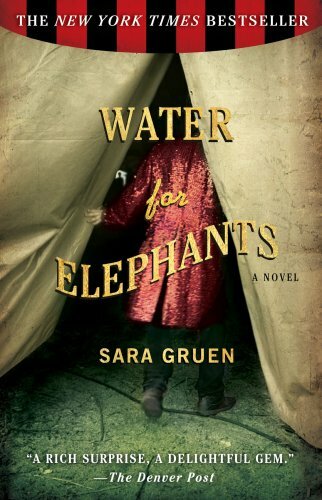 While enjoying the book Water for Elephants by Sara Gruen, I found it to be confronting and quite dark in terms of the brutality meted out to the circus workers. My experiences of the joy and colour associated with circuses I attended as a child were challenged. The reality of how hard this life was for those working to bring this spectacular event to audiences was difficult to read about. Of course the main action of the book was set in the 1930s and it was tough for everyone, but the lack of respect for individuals and the privations suffered were appalling. 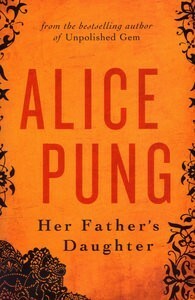 Gruen researched her book thoroughly, apparently and incidences such as when Uncle Al (the owner) had unwanted workers ‘red-lighted’ were disturbing. If that weren’t confronting enough, the few privileged circus people ie. Marlena and August are entwined in an abusive relationship. This then becomes a love triangle with Jacob and Marlena finding a rapport, gentleness and love that her marriage to August is lacking. The book was filled with details of the circus workers, some of them so sad and heart wrenching ie. Camel, Kinko and Queenie and who could forget about the detailed description of Barbara the stripper and her dangling breasts. We miss all of this gritty background in the movie and Uncle Al is eliminated completely. The script is pared right back to concentrate on the central themes of a man’s moral compass, self worth, mental illness, illusion versus reality. The movie then, almost isn’t about circus life during the depression. By taking out all of this extra detail, the themes explored could be set anywhere. Having said this though about everything the movie is missing, it does give something in return. The opening scene of the men manually raising the Big Top is magnificent and for me, recreated the excitement felt as a child when attending a circus performance. This then is the strength of the movie, it gave back to me the happiness, marvel and splendor I had personally experienced. The visual experience enjoyed in the movie was a winner. So now when I reflect on Water for Elephants, I find the experience of reading the book and then watching the movie blend to create a complete experience. Having all the detail of the book already enmeshed in my mental library, I found the movie despite missing many elements enhanced the whole. The experience of only watching the movie in this instance would not give the same comprehensive picture of circus life during the depression with its associated grittiness. Enough for today, book versus movie, round 2 tomorrow. How do we come to read books that we ordinarily would try to avoid? When The Boy in the Striped Pajamas was handed to me by one of my first book group ladies, I had no prior knowledge of the book. The naive premise as shown in the opening chapters with young Bruno arriving home from school and finding his home is being ‘packed’ as they are all going on a ‘great adventure’–his father’s job requires them to relocate’, didn’t prepare me for the story to come. A picture of genteel society and a happy home life are painted, but balanced with the dark underside of this story, the book as a whole is quite shocking. Similarly in The Zookeeper’s War, where Conte writes about an Australian woman, married to a German zookeeper, during the Fall of Berlin, the author points to the general populace’s ignorance of Nazi atrocities. He argues that they didn’t want to know. Choosing the backdrop of the Zoo to showcase the message was for me a powerful ploy. In this book, more than in any other, I really saw how the day-to-day life of civilians were affected by the presence of war throughout their country. Most were just trying to survive by keeping their heads down and minding their own business. This type of attitude of course, doesn’t leave any room for heroism in times of great adversity such as war. We know the inspiring stories of people such as Oskar Schindler who put their own lives at risk to save others. This is an underlying theme of Markus Zusak’s The Book Thief, where he shows the strength of individuals and the many complex motivations for actions they take. Having Death as the narrator of the book was an intriguing device as he shows Death to be sympathetic to mankind and disliking of all the despair and destruction brought upon humans by War. I would have imagined Death enjoying and being friends with War so just the very contrariness of this opens the reader to a whole new level of understanding. Death’s final pronouncement at the end of the book that he is ‘…haunted by humans’ shows his sympathy for the humans whose souls he carries. Death cannot reconcile the astonishing cruelty and compassion of which humans are simultaneously capable of. And so we come to The Post Office Girl, Stefan Zweig’s possibly unfinished novel which was published posthumously. Written in the 1930s as Zweig was driven by the Nazis into exile, the manuscript was found amongst his papers after his suicide in 1942. Some describe this as a ‘Cinderella’ story–but the Prince doesn’t actually come and find her! The story is fierce, sad, moving and ultimately, frightening as we journey with Christine and then Ferdinand as they spiral downward in Zweig’s portrait of a world coming horribly to an end. So there we have four books, each of which have approached the subject of war and its resulting damage with a different and original premise. I’m pleased to have read them all. The question I must ask then is, when does a book become more pleasurable than disturbing?